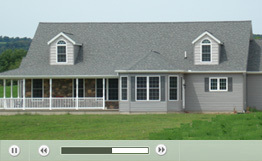 F& N Homes is a custom prefabricated home builder located in Central Pennsylvania. F&N has been building quality prefabricated homes for more than twenty years. A prefabricated home is built from component parts that are manufactured in a factory and transported to the building site, where they are assembled and placed on a foundation. As a custom builder, F&N Homes can build a prefabricated home in any style, ranging from a multi-story traditional to a single story contemporary. Prefabricated construction offers superior quality and the same design flexibility as traditional, or stick-built, construction. F&N Homes will help you build the home that is right for you. With prefabricated construction, custom design is easy and affordable. We have a wide variety of standard floor plans from several top quality home manufacturers that we can modify to meet your exact specifications. Alternatively, you can bring us your own set of plans or just a good idea and we will work with you to design and build the custom home of your dreams. F&N Homes has the experience to guide you through the entire building process. We will help you make quality choices that meet your needs and stick to your budget. If you are thinking about building a home, consider the advantages of prefabricated construction. Send F&N Homes a message or call us at 570-753-2440 to set up an appointment.